When it comes to Caribbean vacations, Puerto Rico is both a departure point and a destination. For the former, San Juan is one of the busiest Caribbean cruise ports. Four piers located along the San Antonio Canal serve ships from the largest cruise lines, with more than 1 million travelers passing through yearly. 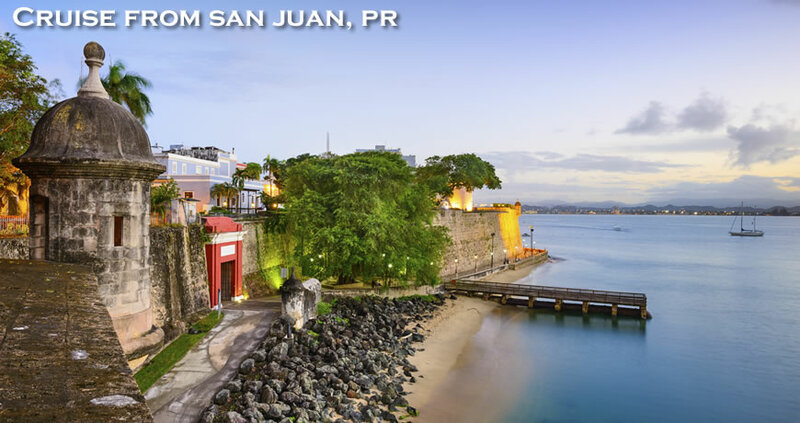 While the San Juan area makes for a fun and exciting pre- or post-cruise trip, the city’s port is the start of a great southern Caribbean vacation. Because of this, nearly all well-known lines stop in the city, either to begin a southern Caribbean trip or as part of a repositioning cruise with a unique and expansive itinerary. Departing cruise lines include Azamara, Carnival Cruise Line, Celebrity Cruises, Crystal Cruises, Disney, Norwegian Cruise Line, Royal Caribbean and Silversea. 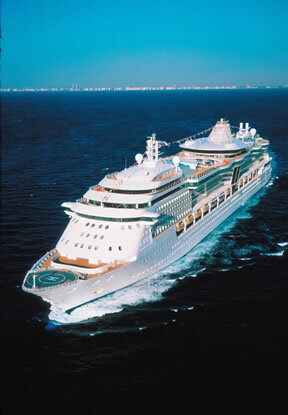 San Juan, in fact, may see as many as 10 cruise ships at once. Southern Caribbean trips from San Juan give travelers a taste and sight of each island’s unique character. A trip, in fact, may take passengers to Aruba, Barbados, Dominica, the Virgin Islands, Curacao, St. Kitts, St. Maarten, and other locations. San Juan Luis Muñoz Marín International Airport (SJU) services the island of Puerto Rico. It is the island’s main international gateway, and its main connection to the mainland United States. The Airport is located approximately 10 miles from the Pan American Pier (for Royal Caribbean and Celebrity cruises) and 11 miles from the OSJ Piers (for Carnival cruises). It usually takes about 15-25 minutes in a taxi for the trip, dependent upon traffic. The Tourism Taxi Program, recently instituted by the Puerto Rico Tourism Company, has simplified the fare structure between the airport and several major tourism zones, including the piers. When coming out of the airport, go to the taxi stand and they’ll give you a slip with your set rate on it. The rates are per taxi and many are vans or minivans, which can accommodate up to 6 or 7 people. There are additional charges for baggage. 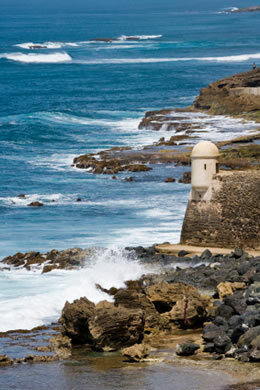 Cruising from San Juan, Puerto Rico is your gateway to the ports of the Southern Caribbean. With miles upon miles of white sand beaches, plus an unbelievable rainforest and warm tropical temperatures, it is also a wonderful place to spend a few days pre or post cruise. Here are my tips on attractions worth visiting. 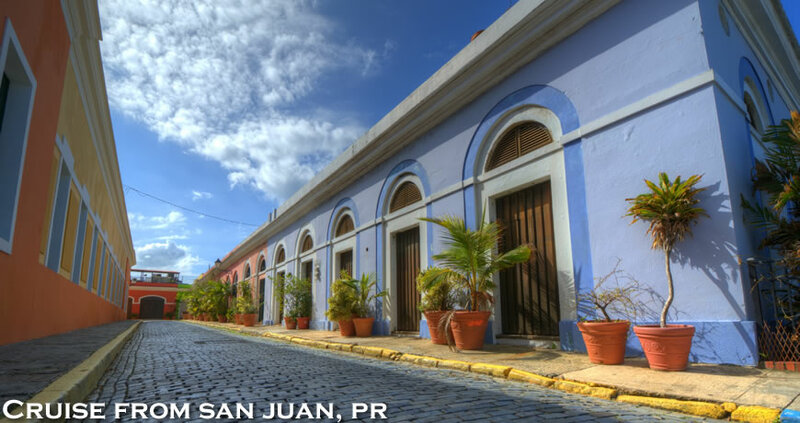 Old San Juan: A leisurely walk through Old San Juan is one of the most pleasant experiences anyone could have here in Puerto Rico. The colonial architecture of hanging balconies and cobble stone streets make you feel like you have gone back in time. You can also take advantage of thefree trolleys. The one marked “City Hall” concentrates on the streets of Old Town while El Morro Fort takes a very scenic route by the sea up Calle Norzagaray, past the museums and eventually to the Castillo San Felipe del Morro. El Yunque: Forty minutes outside of the city, this national rainforest which is protected and maintained by the US Forest Service, is definitely worth the visit! Inside its misty, dense vegetation you’ll find rare Puerto Rican parrots, hear the constant cheep of the tiny coqui frog and come across small waterfalls with picturesque pools to take a dip in. There’s a road to the top of the mountain so you can drive in, or you can park below and try to hike up. The visitor’s center about mid-way up the mountain has useful information on the rainforest’s plant and animal life, plus maps, restrooms and a cafeteria. Bacardi Run Factory: The six-story pink tower, where rum is distilled, is called the “Cathedral of Rum.” There are free tours of the plant leaving every 30 minutes, which allow you to see all the inner workings of this factory, which pumps out over 100,000 gallons of rum daily. The Beaches at Isla Verde: Plenty of shady palms, local restaurants, parking and shower facilities are just a few of the amenities that make this beach so popular with visitors and locals alike. Here you can get beach chairs and the staff of the respective hotel will bring them directly to the location you choose. Lifeguards are usually on duty. Any of the hotels along this beach would be a great choice for an extended stay. Castillo de San Felipe: Commonly known as “El Morro” this stronghold is believed to be one of the oldest Spanish forts in the Caribbean. 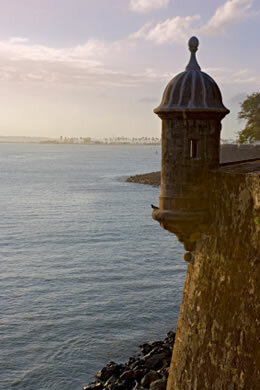 Built to deter invaders who sought to topple the Spanish Empire, this six level fortress has 140-foot walls (15-feet thick) some of them dating back to 1539, it is even topped by a lighthouse! You can take an enjoyable guided tour through the whole complex which is now a UNESCO World Heritage site. 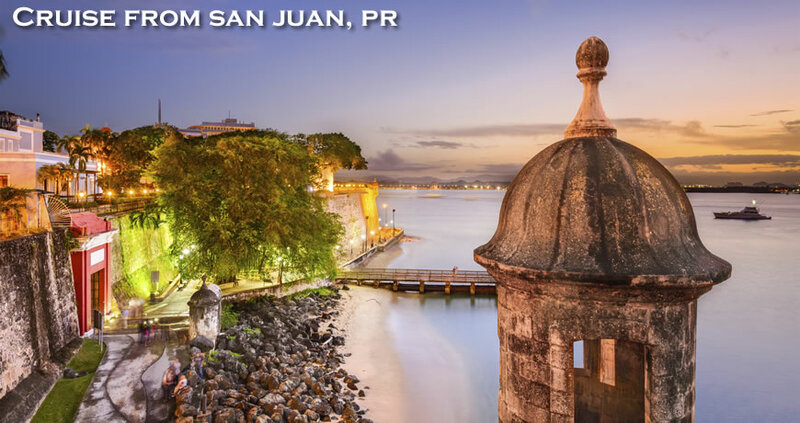 For more information on cruises departing San Juan, contact Direct Line Cruises at 1-800-352-8088. •Exit the Airport to San Juan taking the middle lane on Baldorioty Ave.
•This avenue will take you to New and Old San Juan. •Once you are at the end of the avenue you will find a traffic light. •On the right you will see the Condado Lagoon and on your left you will see the Yacht Club. •This is a one-way road. •Stay in the left lane and follow the signs directing to San Juan or the Convention Centre. •Keep to your left and make a U-turn whenever possible. •After the turn, remain on the right hand side and continue forward past the Yacht Club, Sizzlers Restaurant. •At the corner make a right, continue to the traffic light. •Make a right hand turn at the next right. •Follow the road to the entrance of the pier.